Now that my hair is a little bit longer, I was able to show you a different way to start this style, and how to get a higher and fuller finish. You don’t need to have curled hair to do this style, but it may help when it comes to bending your ends under! Just watched this tutorial and loved it, it’s inspired me to try it now my hair has grown out! Thankyou so much! It’s so beautiful! I’m an idiot with my hair though, so I’ll leave the pretty hair-dos to you! Gorgeous! I always have trouble putting in the bobby pins like you do. Can you do a tutorial on how you insert the bobby pins? You make it look so easy! 🙂 Thanks! I would love a tutorial on bobby pins, too!!! There are so many styles I would love to do, but can’t seem to figure out those darn bobby pins! Me too! I know zig-zag side down, but I always have trouble knowing how much hair to grab with the pin . . .
Def trying thifor the wedding Iam going to tomorrow but my hair is back length. Gorgeous! I can’t wait to try this style out. Thanks again Kate for your great hair tutorials. Totally off subject, but the bib necklaces you love so much are on sale at groopdealz for 19.99! They’re available in just about every color you could imagine 🙂 I ordered myself two! This is just to cute!! Thanks Kate, I now can’t wait for my hair to grow out!!!!! past winter and am now ready for some nice up doo’s. Kate, this is gorgeous. I’m trying to grow out my hair so that I can do more of your hairstyles in the tutorials. The tutorials are so helpful! :)You are seriously so talented to learn all those tutorials by yourself. Thanks for sharing them! This look is very pretty Kate, but I think it makes you appear too matronly. Possibly it is the top that you are wearing, mixed with the drop earrings. It reminds me of something from Little House on the Prairie. Please don’t get me wrong. I am not bashing you. It was just my first reaction when I saw the pics.Possibly with a light, breezy summer top or a sundress it would appear differently. Love this one too bad my hair is not long enough to wear it this way..
Love you and your blog.. CUTE!!! This is such an adorable hairstyle on you 🙂 I wish my hair wasn’t short 🙁 But I must try it when it is longer!! Hi Kate, I love this style! I have fairly long hair (about shoulder blade length) and I’m wondering what the best way to put the sections of hair up would be for length? My hair is shoulder blade lenght as well (or maybe even a bit longer) I also want to know how to do this hairstyle with longer hair, realy love this updo. Love your hair color! Can you blog a little more about how you choose color for your hair. Shoot. I just lopped off my hair again! Inverted bob for the sweltering heat. I’ll have to try this one in a few months. Super cute!! Your hair color is beautiful! Could you please give some information about what line/toner you use on your highlights so I can try and recreate! Thanks. I want to try Aquage, but wanted to know if the company does animal testing. Does it say on the bottle if so or not? You got me thinking so I just checked my bottle. It says “No animal testing”. Such a great hair style. I am going to try it for work. And… I love your earrings, so cute. Where did you get them? Kate, your hair and dress both are adorable! The color of the dress also looks very good on you. Are the earrings some that you and your sister made? Kate, great hair! So versatile depending on one’s lifestyle. You look radiant too btw. I have a QUESTION!!! you seem really at ease with your body and comfortable in your own skin. Do you have any body issues? If so, how do you handle them? Your amazing! This is soooo classy and pretty! I will definitely be trying this on my own hair soon. Thank you for the video! Lovely up-do, very elegant. I’m definitely going to try it out. Thanks so much for the video instructions. Can you do a tutorial on how to correctly apply bottom eyeliner? You make it look so easy! I think I have it then look in the mirror and it’s a rats nest! Lol my hair is very sim to yours just need more hands! Thanks – keep it up! Just wanted to let you know that I picked up some Kenra 25 yesterday and it has changed my life!!!! I always wondered why my hair would never stay the way I wanted it to….well go figure, my hair spray sucked! Thank you so much for recommending this product! My bangs aren’t in my eyes for the first time ever! Woohooo! Thanks to your tutorial, I was able to style my hair this way. You do such great tutorials and have great styles…plus I love your hair! Thanks for all the knowledge you share…I’m gonna give this one a try tonight! Adorable, Kate! By the way, you look beautiful in blue! love this! but maybe its not meant to be if you have long hair? mine falls below my elbows. i’ve been trying to get it down for a wedding on saturday but theres too much hair! guess thats a good thing rather than a bad thing lol love the look! HI! Just love ALL your hair tutorials! I am a 37 mom of two with long hair…over 22 inches. So, I have been taking your hairstyles and tweeking them a bit to use with my length of hair. So far they have been working out! Thanks so much for the inspiration! Oh my goodness, Kate…really!? I LOVE this hairstyle and it seems so easy! Thank you for sharing…I can’t wait to get home from work and try it out! Hi! That top picture is ME! On my wedding day 5 years ago 😉 A sorority sister of mine saw this and brought it to my attention! So glad you liked it, yours looks beautiful! Kate, you have literally changed my life. I’ve always said that I wanted to take a class on how to style my own hair in cute, new ways. Thanks to you I have been rocking a new ‘do every day and it has helped pull me out of my post-breakup slump. I feel pretty every day! Thank you so much for everything that you do!! Kate, just thought you’d like to know, your blog has changed my LIFE! I FINALLY know how to do my hair and make it have volume and loveliness everyday! I can’t believe I have been walking around my whole life letting my hair be limp, flat and lifeless! Thank you for your easy to follow hairstyling videos! at a given time. With the hoped for designer miu miu hobo bags being available at such an easy price no coco chanel online one can actually stay away from them. Therefore, if you are contemplating about whether to purchase hermes bag outlet or not, then you should go for them without any delay and buy handbags at will. With the availability of varied color and sassy designer louis vuitton wallets and that too at a cheap price, women can get the omega speedmaster watches according to their preference without any issues related to price. Please let me know if you’re looking for a writer for your blog. You have some really good posts and I believe I would be a good asset. If you ever want to take some of the load off, I’d love to write some articles for your blog in exchange for a link back to mine. I love this style! What would you do with longer hair where the tails are trickier to tuck in? You make it all so much simpler! Thank you! I did this for a formal fundraiser event and people were complimenting me all night-I passed on your blog address! Today I’m rocking the french braid/side messy bun and a MALE coworker just complimented me on my hair. You make it so easy – thank you! Love this hairstyle! It is so cute. Thank you for the hair inspiration! I will be trying some styles soon. Dear Kate, I absolutely adore your tutorials, but unfortunately, they aren’t working for me because my hair is just too long (inferior angle of my shoulder blade). Do you have any advice? Besides cutting my hair, because I really like it’s lenght. Hi – I have never been able to do an updo myself, and I had a fancy work event Friday night and followed this step by step and it turned out perfect on the first try!! Lasted all through the night. All of the girls at my table had their hair professionally done and mine looked better than theirs. Thank you thank you! I am a waitress at a 5star hotel and restaurant and I have had the worst time with my hair up do’s until I started looking around Pinterest and found you. Thank you so much for “holding your own mirror” and posting anyway! Looking forward to more! Would this be possible for extremely long hair? Like hair that is a little over your bottom. 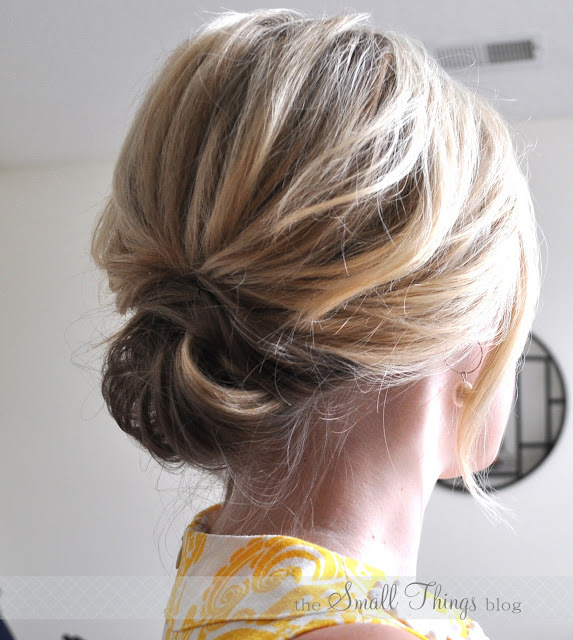 This is really cute and I am looking for cute updo’s; however, I have hair that is very long. Could you just tuck more or would it be to heavy? thank you so much for this tutorial. i am going to the opera in ten days and this will be perfect! Last Friday my husband and I got married on a small German Island (I’m German and he is English) . Everything was so wonderful and just the way I had wished for us. I know it’s just a small extra but I did my hair as I had learned from your tutorial. I added a few hair pins with beads in the colour of my dress and I was so so happy with it. It fitted to us and to me: elegant and festive but at the same time not too overdone dressed up (at this point I have to say sorry for my English and my husband is not here to help me 😉 ). I’d like to send you a photo just of my hair if you like but I don’t want to be obtrusive! I do not have plenty of time to follow your blog and try out all your tips and advices but I read with interest about your life with your young children and the love and care which shines through your words! I remember very well how life was (I had three sons under three as my “second child” has been twins. Now they are big boys of 28 and 25 (twins!) and all the time I felt so blessed with my family). All the best for you and your lovely family! Thank you for the great video. You are so cute! Your outfits and hair are feminine and stylish. Thanks for sharing with the rest of us. I’m wearing my hair like this tonight to a Christmas party. This is great, and you seem so sweet! Thank you!! Love this!! Hope to try it at my next formal event. Hi Kate, I came across your tutorial looking for easy updo hairstyles for my husband’s company Christmas party. The event is being held in a very elegant location and I can’t leave it down (that’s too simple and plain). My hair is always up in a clip or ponytail with a rubber band. I need something different and easy because I never “fix” my hair. This seems super easy, simple and quick. Can’t wait to try it.